Filled with fresh insights and practical tools for growth, "Alone with God" will help you rediscover the power and passion found in time spent with God. - Publisher Embrace the Lord's pattern for prayer. God longs for us to spend time with Him. Yet while His invitation is extravagant, too often we struggle to spend even brief moments with our Heavenly Father. For some, action has replaced prayer. For others, requests can take priority over relationship, as we try to mold God to our desires. How did the simple act of prayer become so complicated? Renowned pastor and author John MacArthur invites you to experience the art of prayer. Here John turns to our greatest spiritual mentor, Jesus Christ, as he takes an intimate, in-depth look at the Lord's Prayer. Filled with fresh insights and practical tools for growth, "Alone with God" will help you rediscover the power and passion found in time spent with God. "Alone with God" includes a guide for both personal and group study, which features discovery questions, suggestions for prayer, and activities, all designed to connect life-changing truths with everyday living. 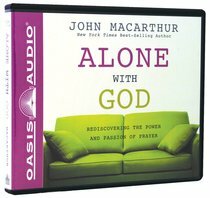 About "Alone With God (5 Cds)"
Embrace the Lord's pattern for prayer. God longs for us to spend time with Him. Yet while His invitation is extravagant, too often we struggle to spend even brief moments with our Heavenly Father. For some, action has replaced prayer. For others, requests can take priority over relationship, as we try to mold God to our desires. How did the simple act of prayer become so complicated? Renowned pastor and author John MacArthur invites you to experience the art of prayer. Here John turns to our greatest spiritual mentor, Jesus Christ, as he takes an intimate, in-depth look at the Lord's Prayer. Filled with fresh insights and practical tools for growth, "Alone with God" will help you rediscover the power and passion found in time spent with God. "Alone with God" includes a guide for both personal and group study, which features discovery questions, suggestions for prayer, and activities, all designed to connect life-changing truths with everyday living. Customer Reviews For "Alone With God (5 Cds)"
Clear and easy to follow book which unpacks the significance of each phrase of the Lord's prayer. Very helpful Bible passages and quotes from famous books on Prayer. Inspires and breathes new life into the habit of prayer with our God.